VRHabilis divers are certified in Underwater UXO as deep sea divers and UXO Technicians. Our cutting edge techniques have revolutionized the industry in underwater Remedial Investigation/Feasibility Studies (RI/FS) and Time Critical Removal Actions TCRA). 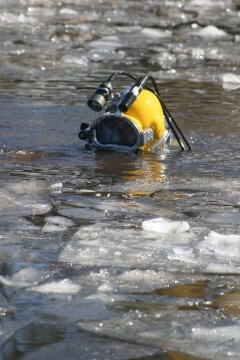 Using the VRH patented Heckhousing™, underwater location of anomalies is now feasible. Working in accordance with industry, federal and military standards, VRHabilis has found Deep Sea Diving, also known as Surface Supplied Diving is the safest, most efficient and cost effective method for our clients. Divers are in constant visual and audio communication topside and with unlimited air supply, can work for much longer periods of time underwater. Our dedication to owning the best gear for every job insures our dive team can operate any time of the year in any climate safely and effectively.